New Creme Brulee Pumpkin Cheesecake will make your dreams come true! 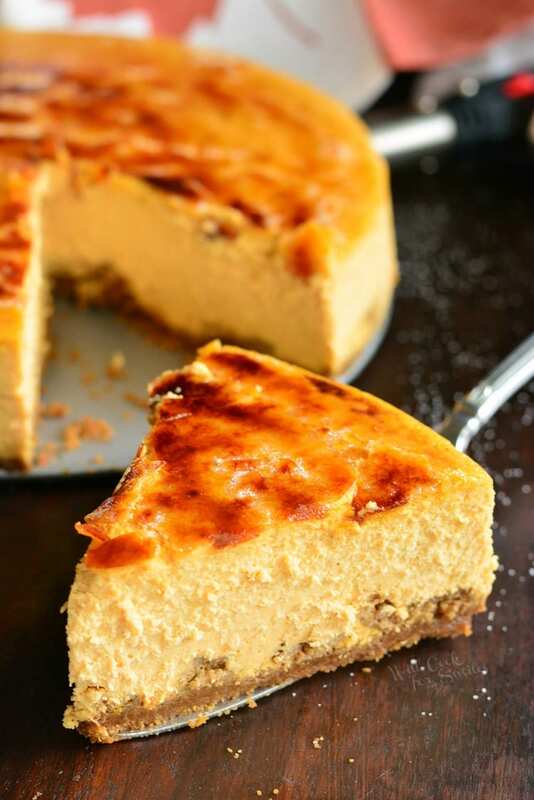 This smooth, silky pumpkin cheesecake is made with the ginger snap cookie crust, extra cookies on the bottom, heavenly pumpkin cheesecake and crunchy, caramelized sugar on top. What is the BEST thing about Crème Brulee? Every time I think about Crème Brulee, I imagine that beautiful crunch that you get when the spoon goes through the top layer of caramelized sugar. That “crunch” you heat, that is just perfection. 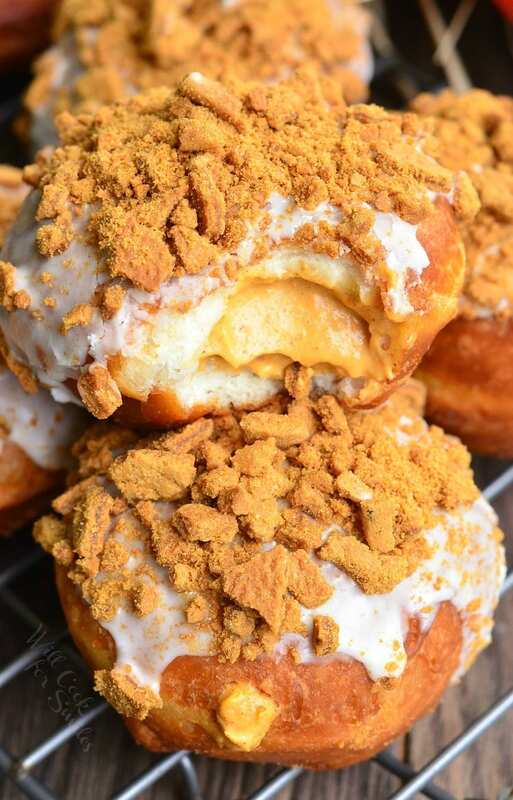 It only gets better from there, when you take a bite of a smooth, creamy custard along with some crunchy caramelized sugar bits. It’s just heaven. 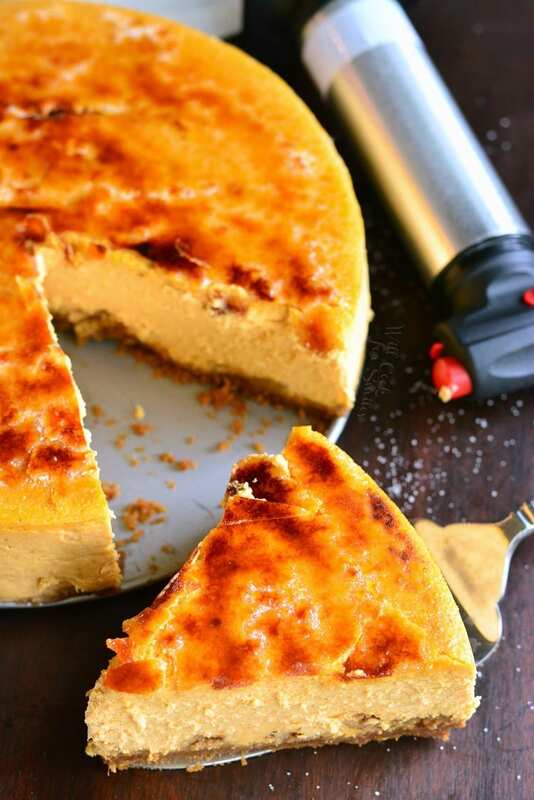 This Crème Brulee Pumpkin cheesecake is just as heavenly! I paired this smooth pumpkin cheesecake with ginger snap cookies. It thought that the flavors would complement each other very well, and they absolutely do. The beautiful, buttery crust of this cheesecake is made from crushed ginger snaps cookies and I also broke apart some extra ginger snaps and just layered them in between the crust and the cheesecake filling. 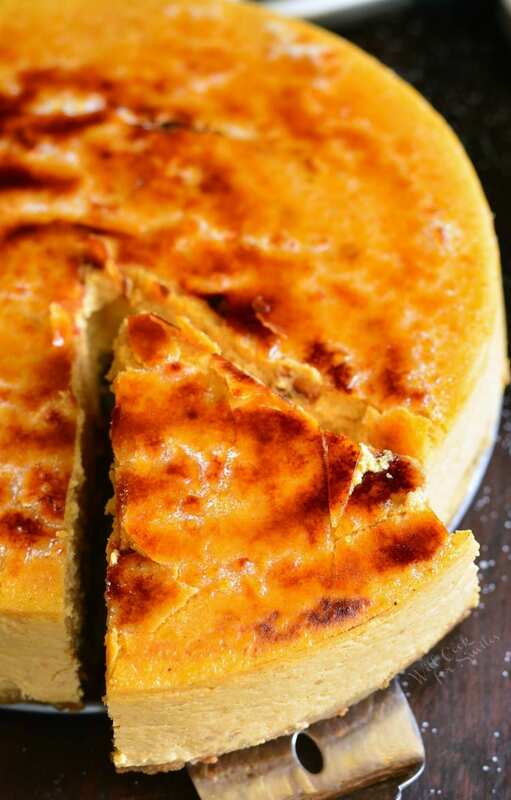 To make the cheesecake absolutely perfect, it has a crunchy caramelized sugar topping. 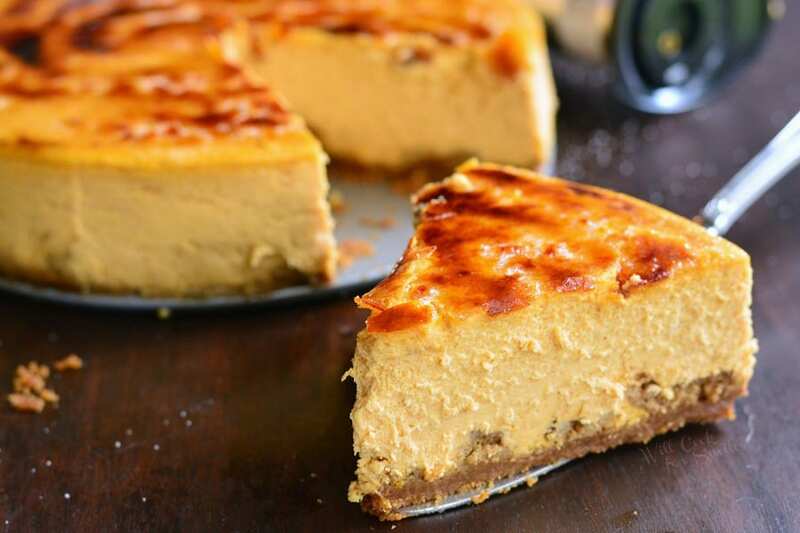 The topping is prepared right before serving by spreading super fine sugar on top of chilled cheesecake and then using a blow torch to burn the sugar to a golden, caramelized topping. My little man calls it a “sweet lollipop” on to of a cookie cheesecake. It’s the cutest description for an amazing cheesecake. 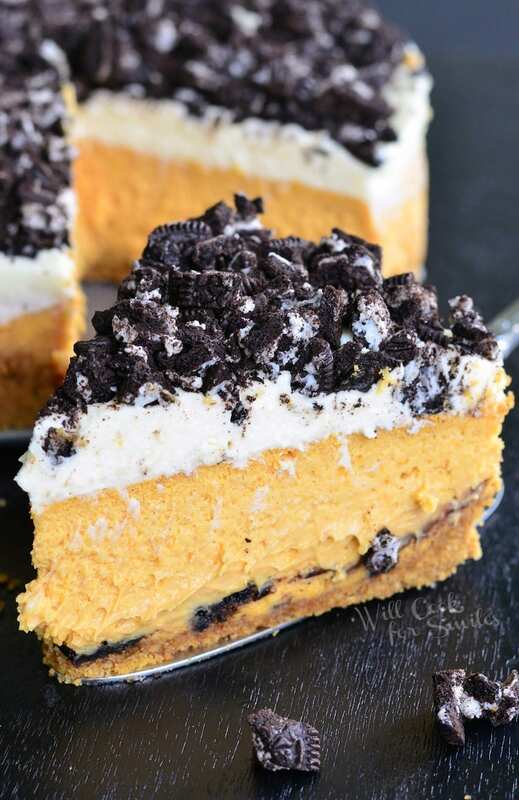 This cheesecake would definitely make the perfect dessert for any fall holiday or celebration. 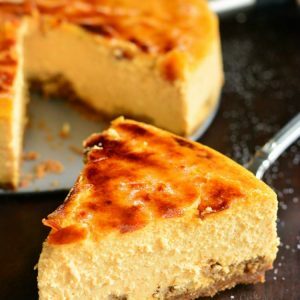 This smooth, silky pumpkin cheesecake is made with the ginger snap cookie crust, extra cookies on the bottom, heavenly pumpkin cheesecake and crunchy, caramelized sugar on top. Pulse about 44 ginger snaps in a food processor until all cookies are crumbles. In a small mixing bowl, mix ginger snap crumbles, melted butter, and pumpkin spice extract until evenly incorporated. Spread the crust mixture all over the bottom of the spring form and press it down. Break up about 20 cookies into small chunks and spread them even over the crust. In a bowl of an electric mixer, beat cream cheese on medium-high speed until smooth and fluffy. Scrape sides and bottom on the bowl, add sugar and beat for another couple of minutes. Add pumpkin puree, pumpkin extract, and sour cream, beat until incorporated. Scrape sides and bottom on the bowl. Lower speed and add cinnamon and corn starch. Make sure that all ingredients are well combined. Scrape sides and bottom of the bowl and beat for a few more seconds, until all smooth. Pour the cheesecake batter into the pan with crust, over the crushed cookies. Place roasting pan into the oven and place cheesecake springform pan inside the roasting pan. Carefully add water to the roasting pan, about half way up the side of the springform. Bake for 80-85 minutes. Turn off the oven and open the oven door half way. Let cheesecake rest for about 10 minutes before taking it out. Take it out of the oven (out of the roasting pan and carefully take off the foil). 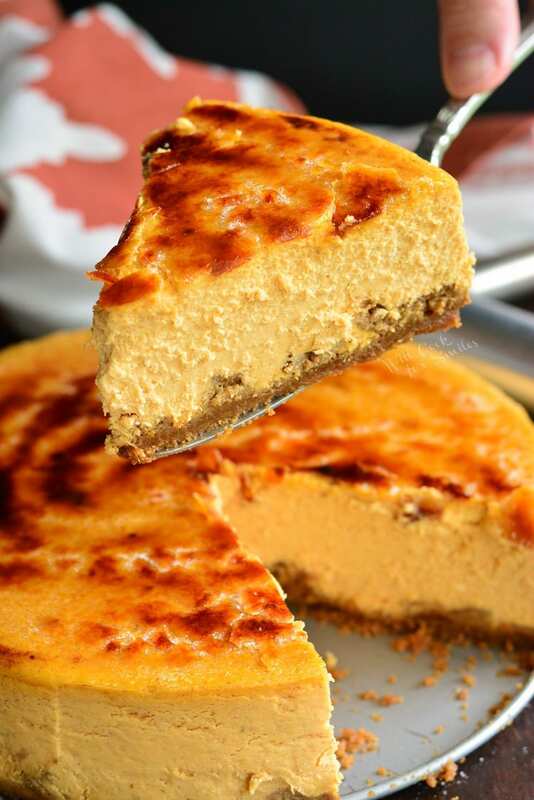 Cool cheesecake for an hour and then place in the refrigerator. Refrigerate for at least 4 hours or even overnight. Take the side of the spring form off the cheesecake. 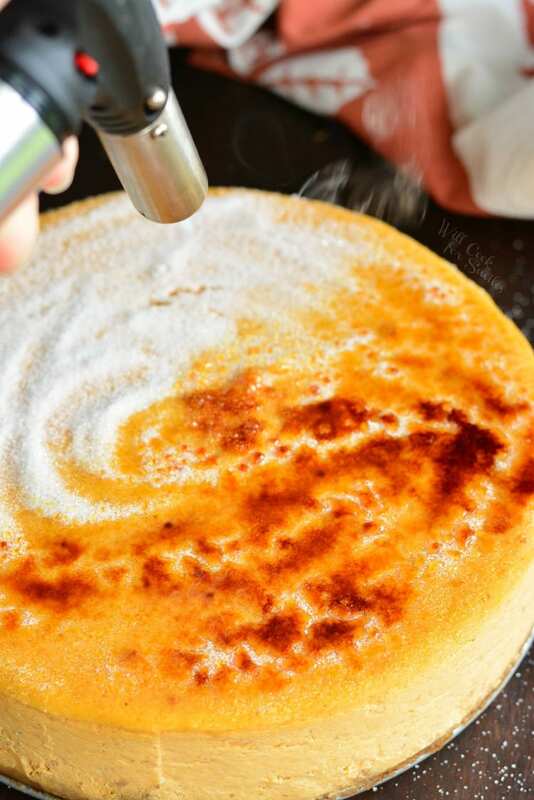 Spread super fine sugar evenly over the top of the cheesecake, evenly. Using a torch, melt the sugar to golden brown as it forms a crispy top. Let it stand for about 5 minutes before cutting and serving. 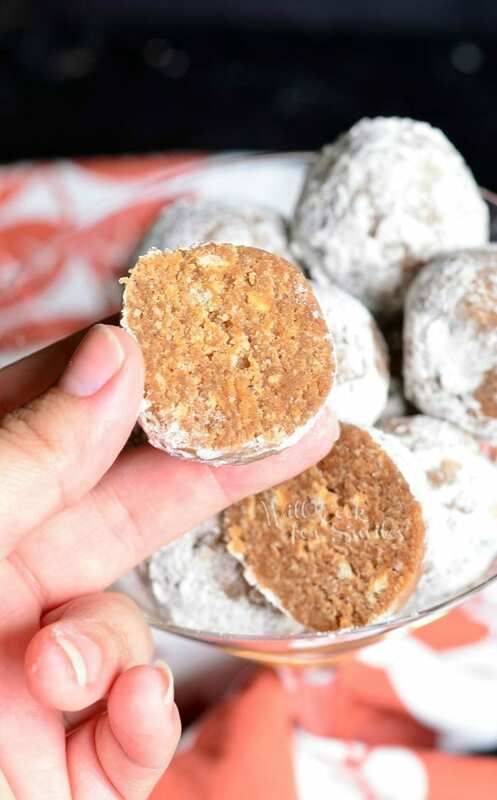 I would love to make your pumpkin spice rum balls – but I do not have any rumchata – is there a substitute I can use? Ellie, do you mean the pumpkin spice cookie balls? If so, you can use extra cinnamon and a creme liquor like Baileys. I want to make this for thanksgiving. How does it hold up being baked, frozen, and then thawed? I really hope it works and I hope you enjoy it!! Hi! I see the recipe calls for pumpkin spice “extract.” So would this be a liquid, like vanilla extract, and not the dry pumpkin spice seasoning? I made this (loved it!!) but the bottom crust part did not get cooked/crisp up at all. Any ideas on how to fix that? The crust doesn’t actually get crisp, but there may also been a little leak in the pan. Sometimes, my pan leaks in a little water, even after it’s been wrapped in foil. Did it seem like that’s what happened?